Miso Crafty Knits: May Day, May Day...Giveaway!!! Today is the first day of May and I thought "why not start the month with a giveaway??". Last week I was contacted by the wonderful people from CSNStores (the same peeps who sponsored my first ever giveaway) to do another giveaway! I'm sure the lot of you already know about this company as they have been sponsoring many giveaways in the blogosphere. If you don't know who they are yet, you should definitely checkout their websites. And yes, I said websites with an "s". 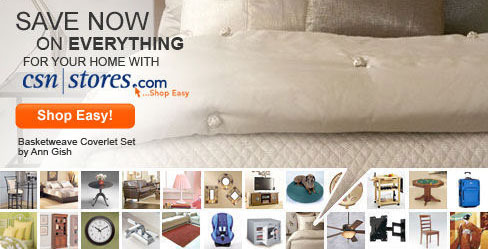 They have over 200 online shops that cater to your every need, from shoes to cookware to baby cribs, CSN has you covered! I had spent hours and hours looking at all they had to offer and couldn't decide on just one item that I would want to give to a lucky reader. I absolutely love the Emile Henry 'Bake for the Cause' Pink Pie Dish (of course! ), the Le Creuset Stoneware Baking Dish with Bonus Dish in the gorgeous Caribbean colorway, the Stokke Classic Tripp Trapp High Chair (I can only dream of even getting that for the Munchkin! ), and am seriously considering on purchasing the ittala Artik 5-Pc Place Setting Cutlery Set. So...what does my indecisiveness mean for you?? It means that you get to choose!! That's right, if you are the lucky winner of my giveaway then CSNStores will give you a $40 gift certificate that can be used on any of their many sites!! And you don't have to just limit yourself to a $40 purchase total, you can put it towards a bigger item! To enter the giveaway all you have to do is leave a comment about what item(s) you would get should you be the lucky winner! For an extra entry, blog about my giveaway and then leave a comment with a link to that post. Want another extra entry? Grab my blog button from over there on the left side and add it to your blog, then leave another comment to let me know you've added it to your blog/site. For those of you who don't have a blog, for every friend who enters and mentions that you told them about my blog and giveaway will warrant you an extra entry! If that's not enough, follow this blog publicly and you'll have yourself another entry!! I would love to get a new crock pot! Oh my gosh! Loved the tractor cake pan, and saw some pretty cake stands I love too! I'm redoing a bathroom and I really want one of their light fixtures to go over my sink! I'm not sure if I would use the gift certificate to put towards something bigger or to get a bunch of smaller things. I've had my eye on some baking pans and utensils. Not that I need any more! i can't make up my mind between a really cute dwell blanket for my daughter or a set of cups and saucers for myself! I really don't know what I would pick! Knowing my history with gift certificates, I would be overly careful and over analyze how I would use it to the point where it would just sit there and I would come back to it and it would be expired! Ugh. But really, I think I would get something kitchen related. I would get new flatware... If it was an option.